Tasikmalaya well knows as Kota Santri. As Kota Santri, there are so many mosque in Tasikmalaya. 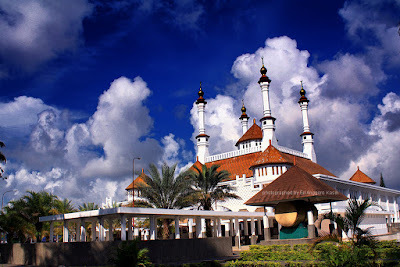 The most beautiful mosque in Tasikmalaya is Tasikmalaya Great Mosque. The mosque is in Tasikmalaya downtown. There is a beautiful park in front of the mosque, called Tasikmalaya City Park. Tasikmalaya Great Mosque located at Jalan Masjid Agung, Yudanagara, Cihideung, Tasikmalaya, Jawa Barat 46121. Coordinate of Tasikmalaya Great Mosquw is S7.326047, E108.219940. You can see Tasikmalaya Great Mosque location on Google Maps below.